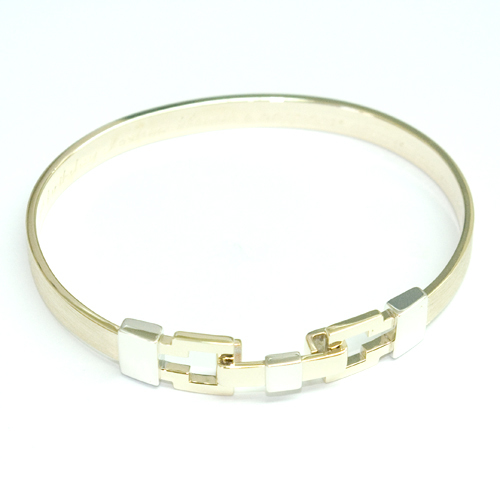 9ct White and Yellow Gold Gents Bangle — Form Bespoke Jewellers Ltd.
A hand made gents bangle cast in white and yellow gold. The customer came to our Yorkshire studio looking for a bespoke, handmade bangle for his son. As a sentimental coming-of-age gift, he was looking for a special design that would replicate his own yellow gold bangle but with a modern twist. With the guidance of our expert jewellers, this unique, contemporary design was created. Where the father’s bangle had round details near the fastening, for the son’s bangle a softened square detail was incorporate in a contrasting 9 carat white gold. The fastening itself was also modernised with an angled open-cut detail. On the inside of the bangle a personal message was then engraved by hand, and the bangle was finished and polished in our Chapel Allerton workshop. Both father and son were delighted with the end result. A perfect example of how Form Bespoke Jewellers can create almost anything to suit your bespoke ideas.